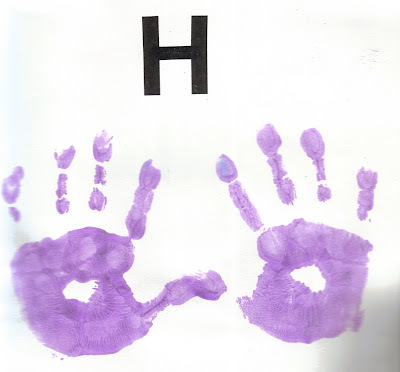 Simple and quick (but messy maybe) - and now we have his handprints to see years later! Who doesn't like helping make food? There was no baking involved in this treat, just a lot of mixing, measuring, sneaking noodles, and stirring. 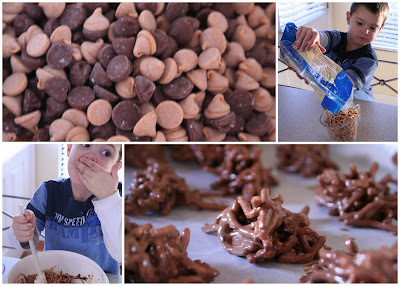 Melt the chocolate and butterscotch chips over medium low heat (or in 30 second increments in the microwave). When completely melted, add in chopped peanuts and chow mein noodles. Place by spoonful onto waxed paper and let cool. This week Zachary had fun playing with my hole punch to make little confetti circles. And dropping little confetti paper everywhere (those little pieces of paper can travel, I tell you!). He punched and punched to his hearts content. Once I'd had about enough of the paper circles, he practiced his fine motor skills: picking up those tiny things and making them into the letter "H". We've also been working on telling time to the hour. We have a great little clock that has movable hands that he loves to play with and since he can identify all the numbers, he is doing great telling the time for us! His only struggle is telling time on our house clock - because it has Roman numerals on it! During the day, we might as well get a little energy out, so the rule was hop, hop, hop! Everywhere and anywhere. "Honor one another above yourselves." Romans 12:10 - We did this verse on our own this week to talk about how we treat our friends and family...after a little incident at our house. :) Zachary wasn't the primary person involved, but we're still working on treating other people better than we treat ourselves - even if we don't think it's always fair. This week we continued using Peterson's Handwriting as our paper work. We also used the confetti holes to make our letters. The Preschool Corner is a place for us to share the ideas we are using during our "preschool time" with our kids. You can join in the fun and record what you are doing in your house. Please link your exact blog post to the Mr. Linky below (if you have questions feel free to ask). Be sure to link back to this blog post so that your readers can find some other great ideas too! The guidelines can be found here if you need them. Share what you've been doing in your house this week! we didnt do the letter H but we did make the haystacks. they were quick and easy & not too much mess. my kids loved them. thanks.